Well folks, our nursery project for my client is officially finished!! I’m so excited for how it all turned out. When I say it took a village, that would be a complete understatement! Huge thank you to my contractor Todd Atwood for helping us pull this off with a tight timeline amidst a whole house remodel in progress. I also want to thank my clients Trey & Bliss Brazil for trusting us to design their sweet baby girl’s nursery. We cannot wait to meet her! 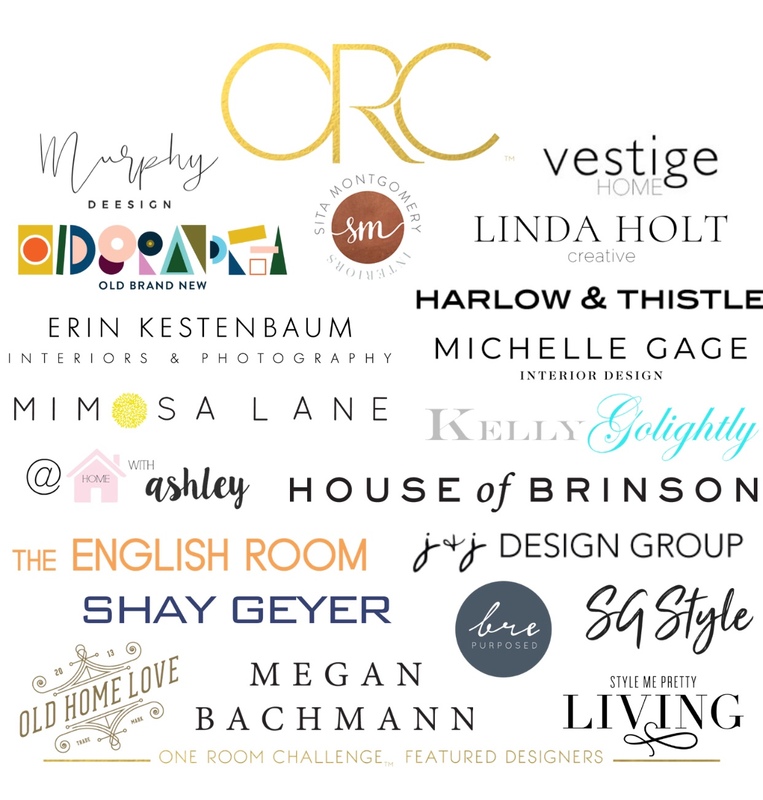 All of this would not have been possible without all of the amazing One Room Challenge sponsors. 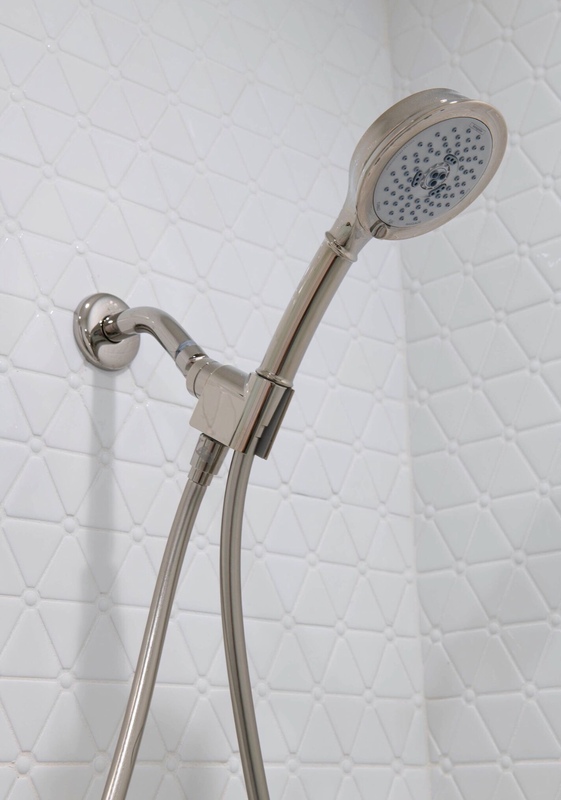 What a treat it was to work them and get to use their products in my client’s projects. You can find the links to everything throughout this post. We’ll also be posting swipe ups on Instagram stories for maximum shopping convenience . I must not forget everyone on #teamIBB especially Jinda Nichols for helping me bring this design to fruition. In case you’ve forgotten what we started with, take a look back here. Now, let’s get to the good stuff!! Remember the rendering I shared with you during week two? Well, here it is brought to life. I’m over-the-moon with how this nursery turned out! I designed a custom day bed and had my upholsterer make it. They never cease to amaze me with their quality and craftsmanship and they’re so great at bringing my designs to life! 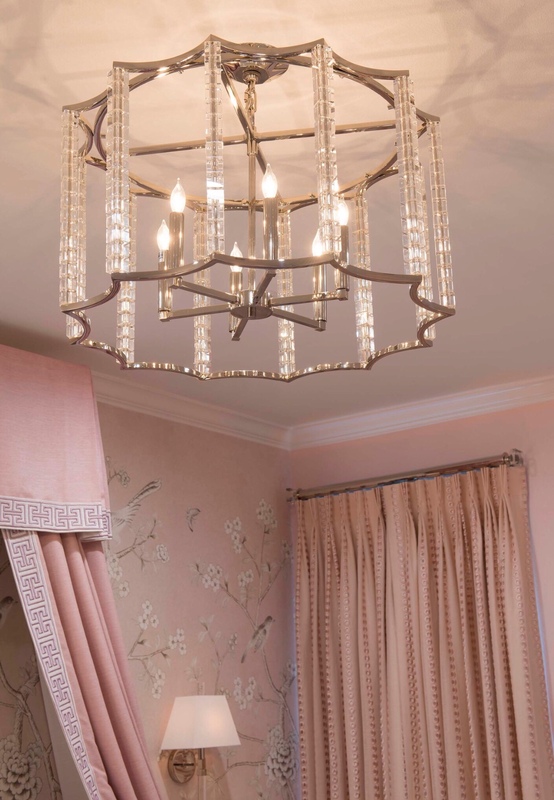 All of the gorgeous fabrics & trim in the room are from Fabricut, Trend & Stroheim. I’m in love with this trim tape. 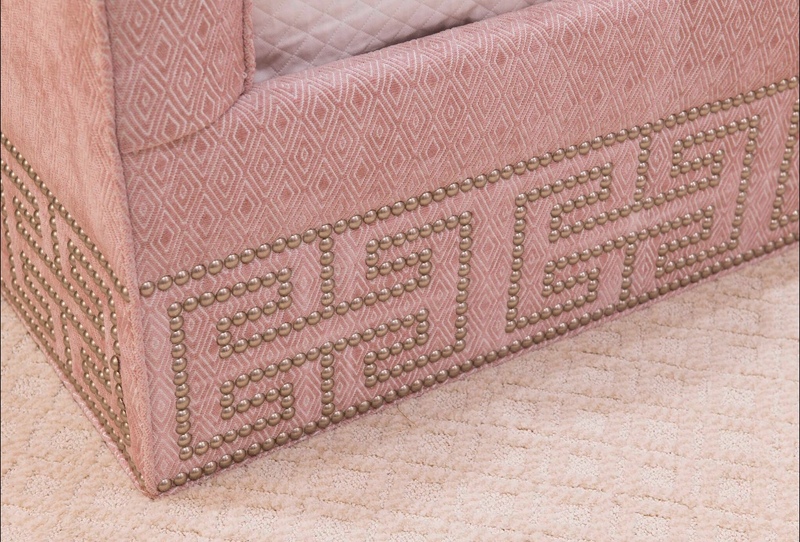 We used the same pattern to base our nail head design off of for the day bed. 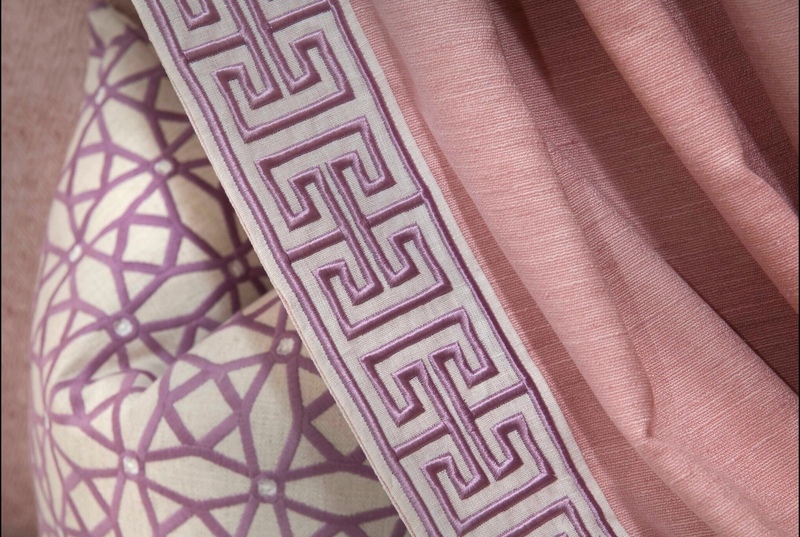 These fabrics are to the trade only and can be purchased through IBB Design. We used the trim on the leading edge on the panels over the daybed & on a few pillows in the room. 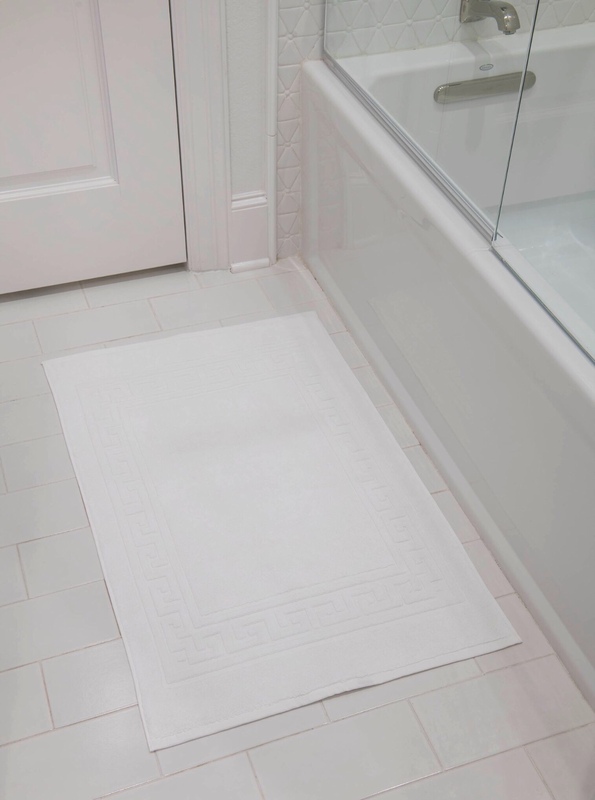 The white matellasse is from Overstock.com. 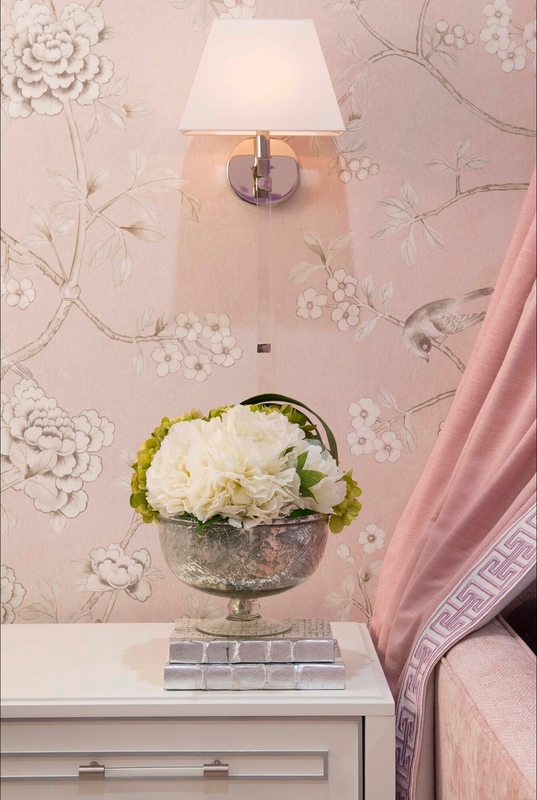 I love how these sconces from Crystorama frame the daybed & that Schumacher wallpaper is EVERYTHING . The beautiful peony & hydrangea arrangement is from The Botanical Mix. The acrylic crib is from IBB Design. The adorable butterfly installation was done by #teamIBB designer Melissa Catalano. The acrylic bookcase was a fun surprise. We originally didn’t think we were going to get it but the team at Overstock.com made it happen. It fits perfectly right between the two windows and gives our clients ample space to store baby necessities, toys & display photos. The chair, ottoman with Tibetan lamb’s wool & drink table are from IBB Design. 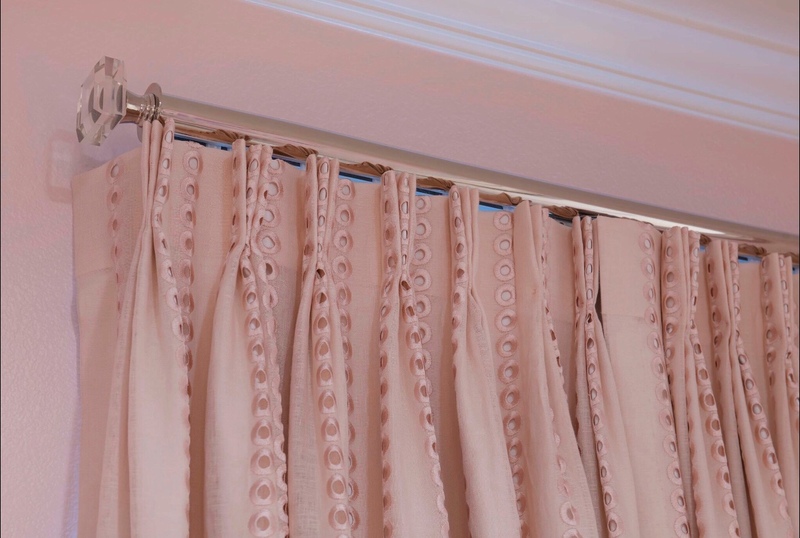 The functional draperies were done by IBB Design in Stroheim fabric lined in a blackout liner. This acrylic bookcase offers great storage without taking up a lot of visual space & ties in well with the other acrylic and crystal accents in the room. Talk about the perfect chandelier for this nursery!! I was so excited to have Crystorama as a sponsor for the ORC. 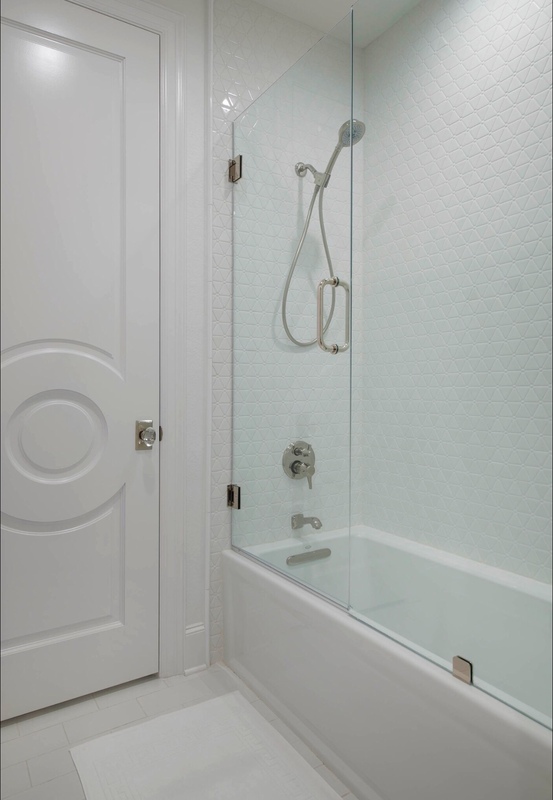 We specify them all of the time for projects and they offer so many fabulous lighting options. This chandelier is available through IBB Design. 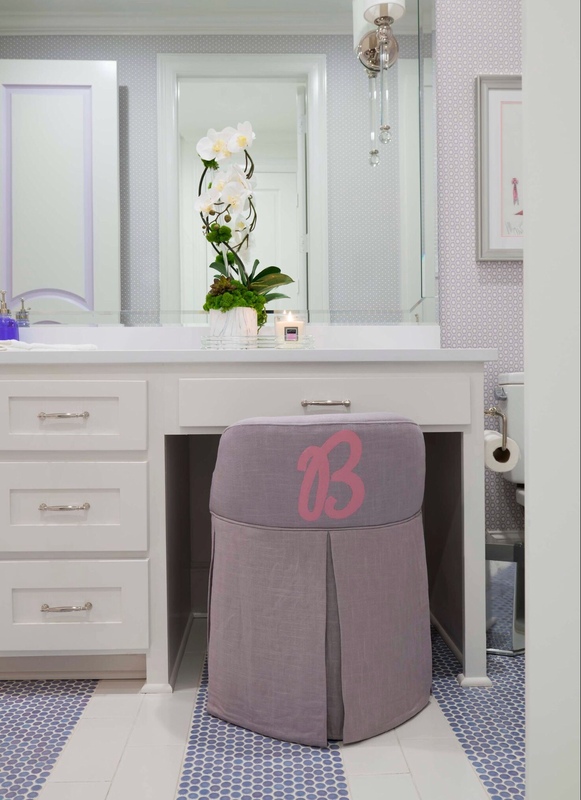 We love to personalize our clients spaces! 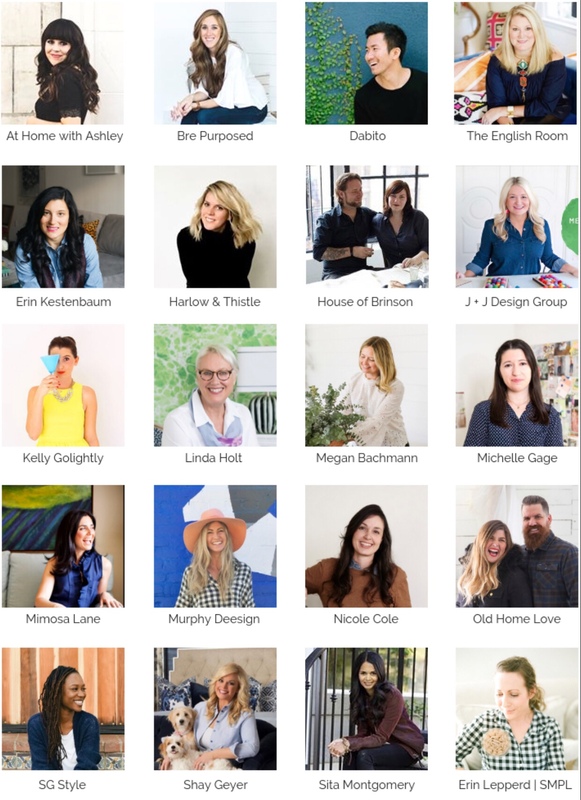 We’re fortunate to have an amazingly talented woman on #teamIBB that makes this all possible for our clients! 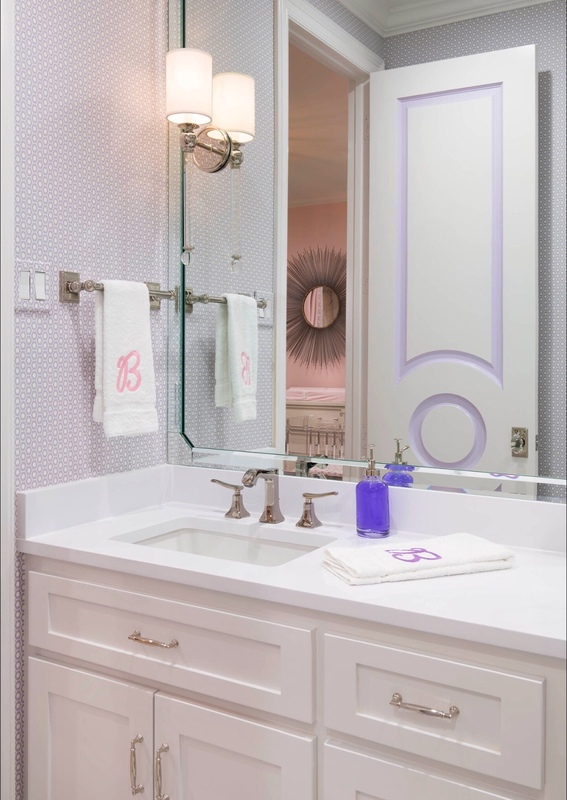 Custom functional drapery & hardware from IBB Design. This mirror y’all! Lamps Plus seriously hooked us up! 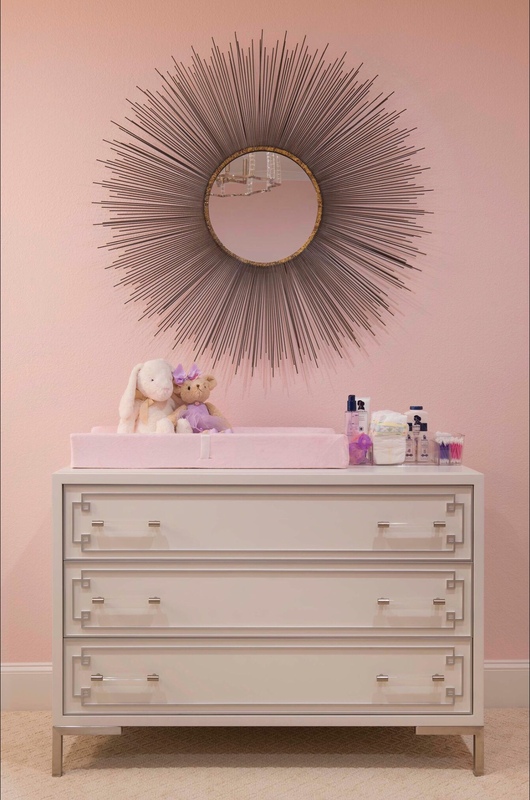 How fabulous is it over the changing table? Pink changing pad is from Overstock.com. 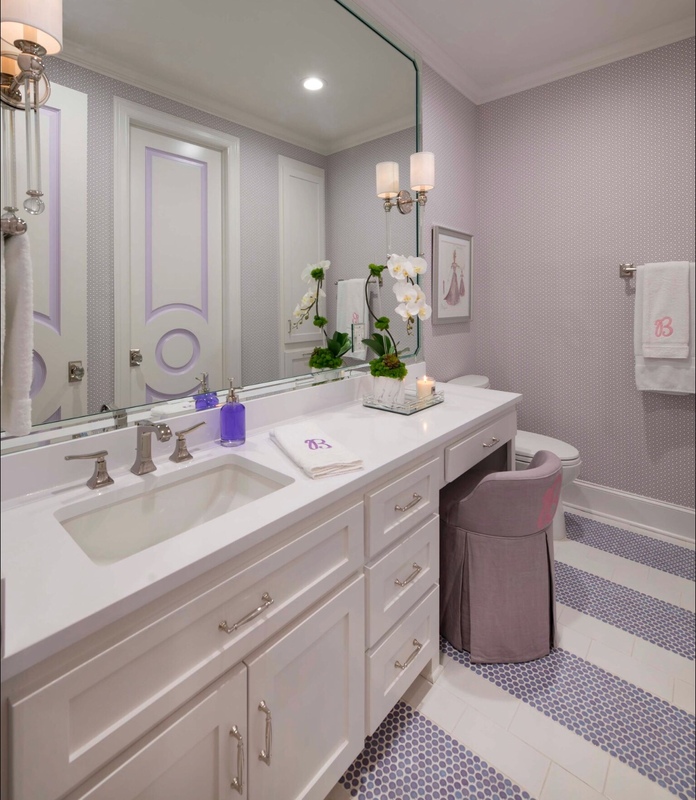 Let’s take a look now at the bathroom transformation. It’s really quite a dramatic difference from where we started! 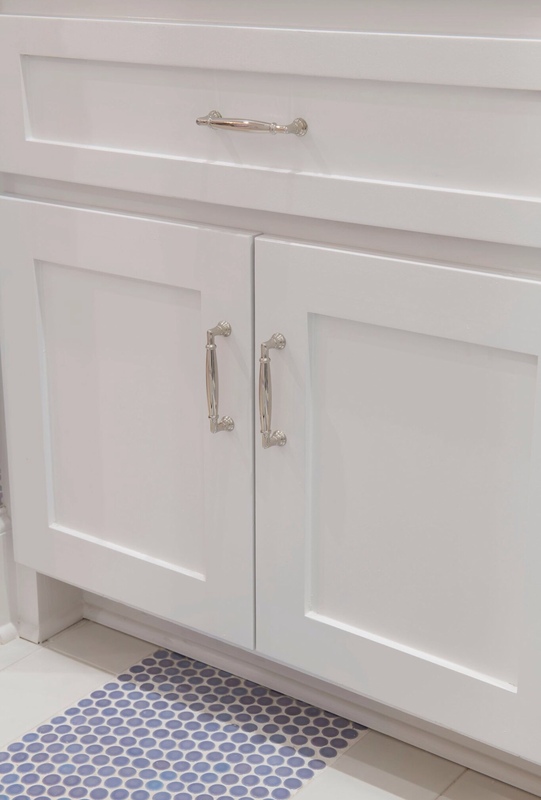 New white quartz countertops were chosen to go on the new vanity cabinet. 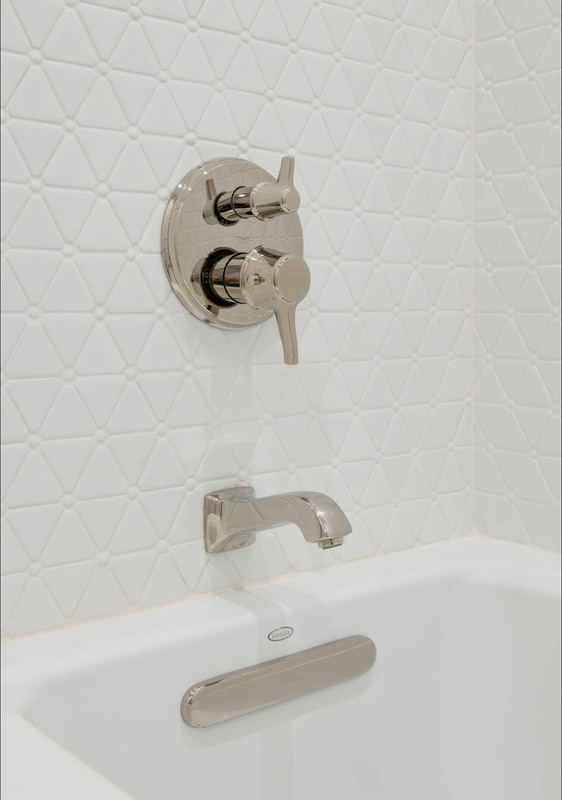 We selected this white Kohler Undermount Sink from Overstock.com & Hansgrohe faucet. 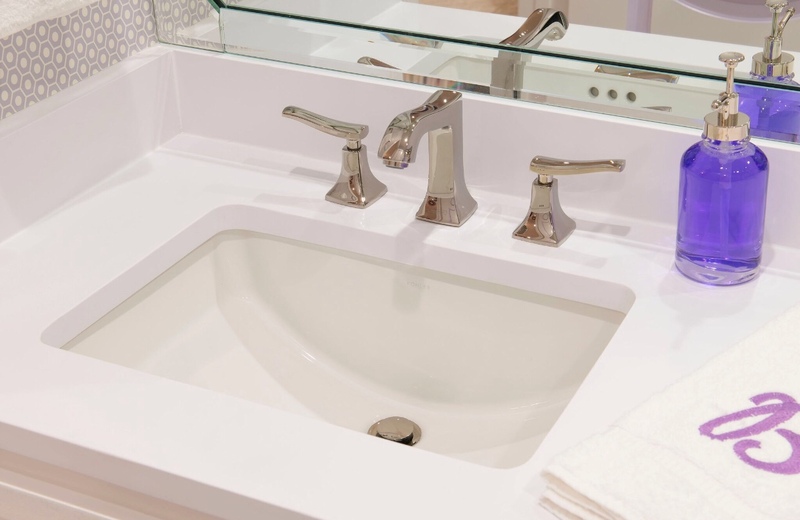 Hansgrohe has a beautiful polished nickel that was perfect for the room. 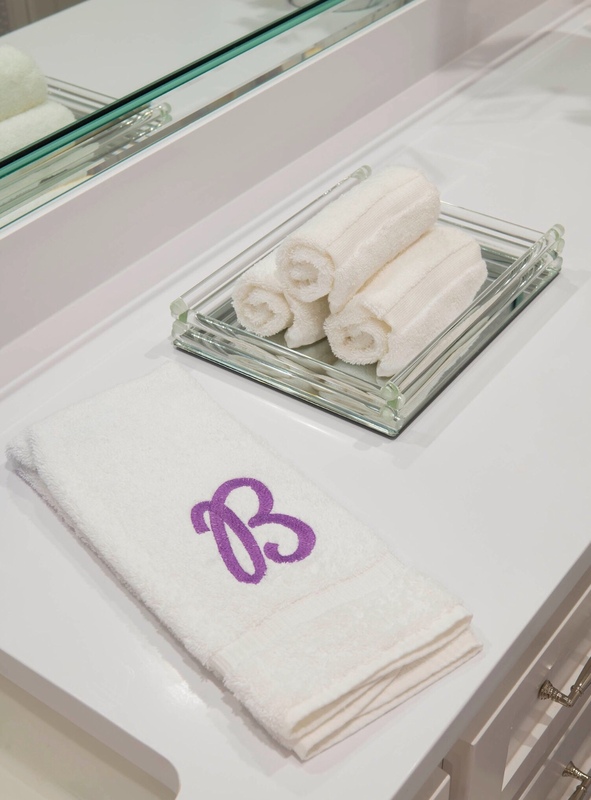 Vanity tray, Turkish wash cloths & hand towels from Overstock.com. 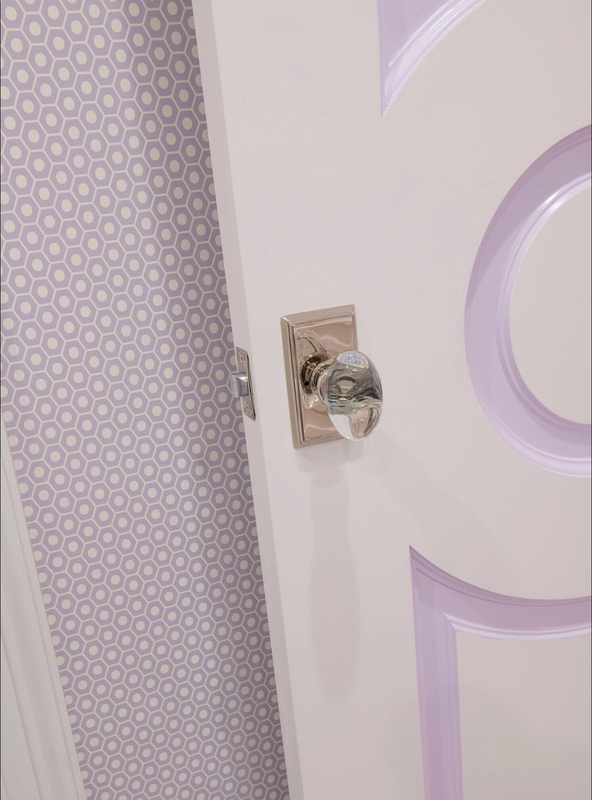 The Schumacher wallpaper & the painted detail on the new doors are two of my favorite design details in the bathroom. 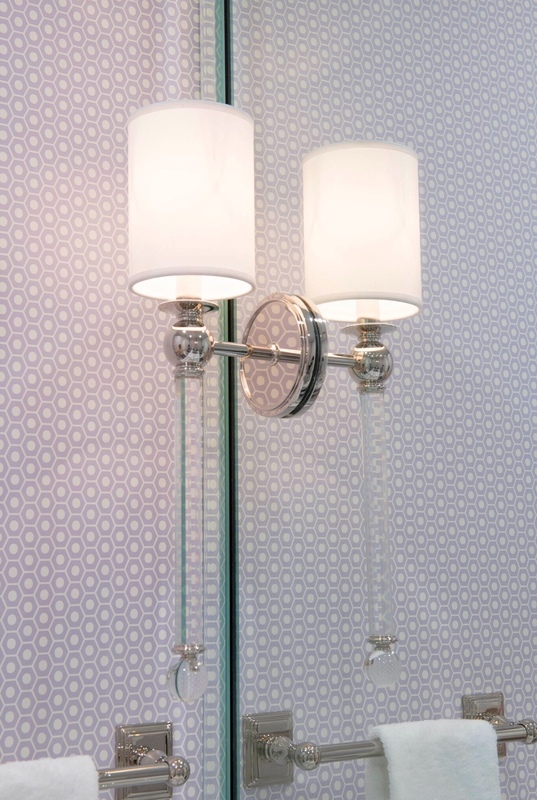 And how about those fabulous Hudson Valley Lighting sconces that we had set in the mirror? 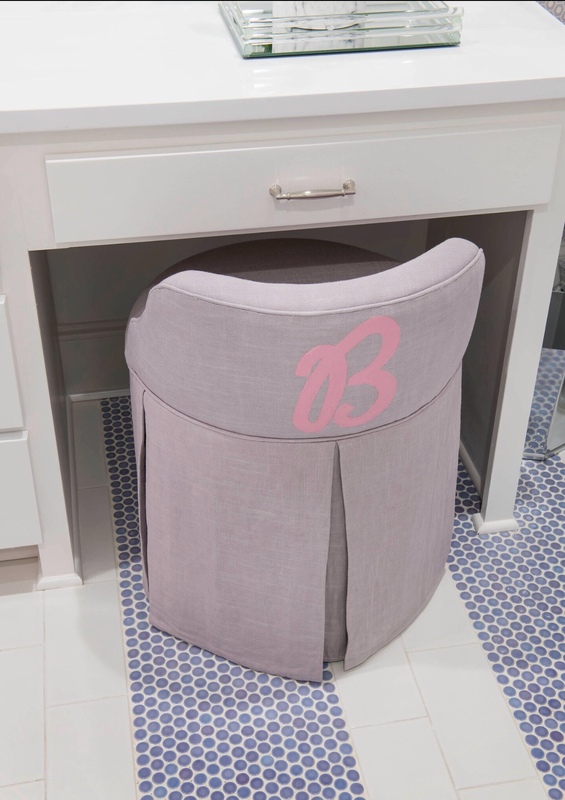 I just adore this little skirted vanity chair from Overstock.com. 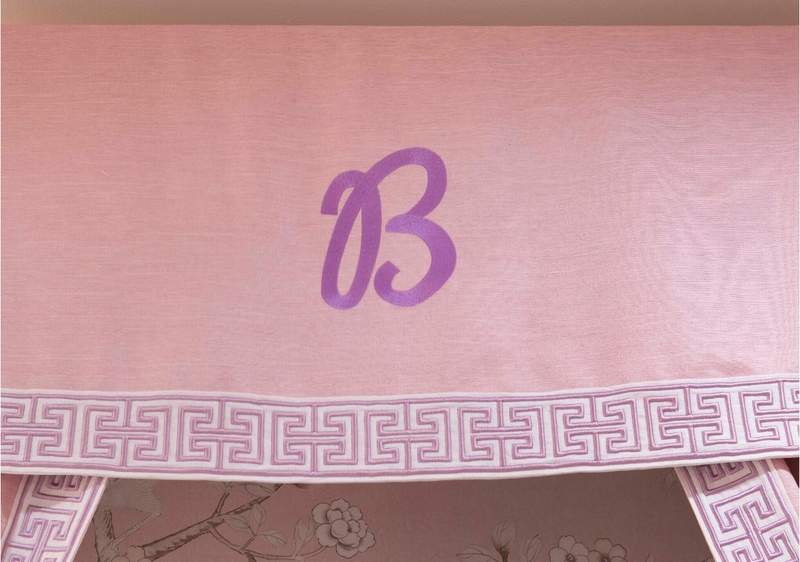 We personalized it by painting a B on it for the sweet baby girl in the same font we used to embroider the towels. 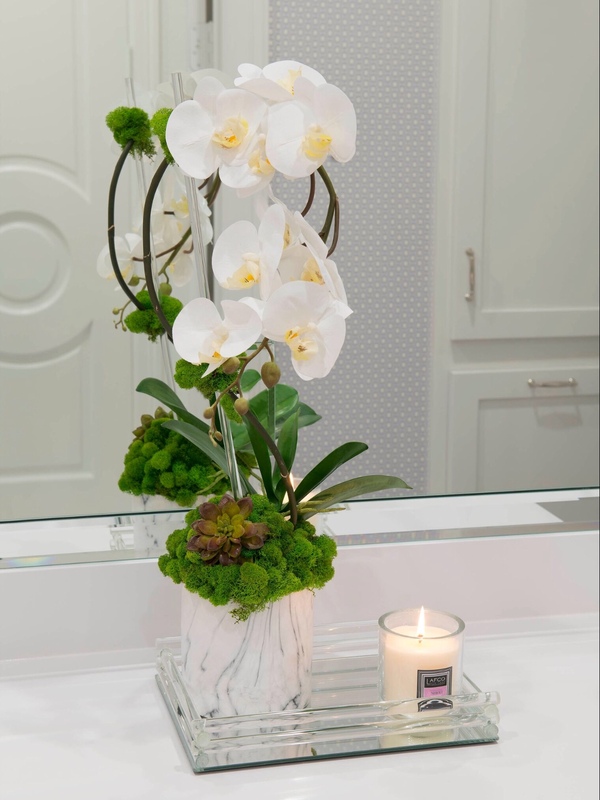 We used the Marbre orchid in white from my collection with The Botanical Mix as an accent on the vanity. The orchids are 3D printed and even feel real to the touch. The moss is preserved and will never turn brown or dry out. 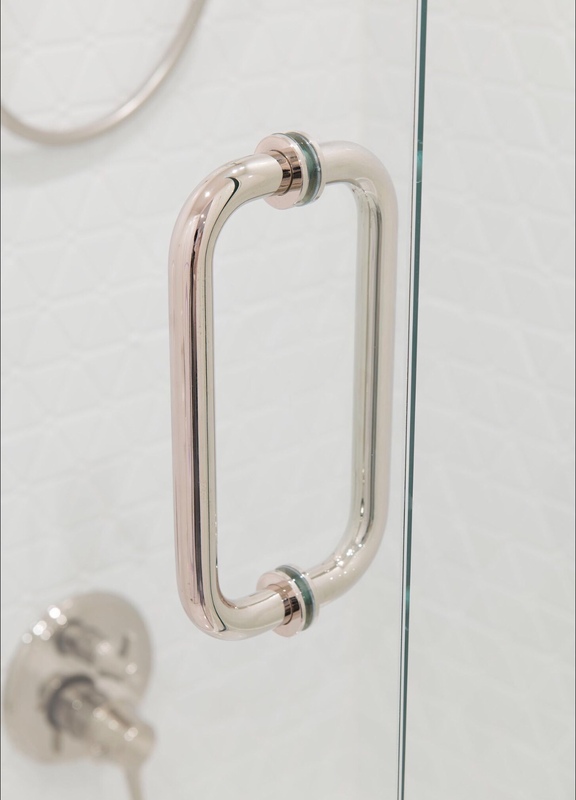 I love how well the polished nickel works with our design scheme. Thank you so much for following along on our One Room Challenge journey. Head over to my Instagram & Instagram stories for more photos, product/shopping links & behind the scenes. 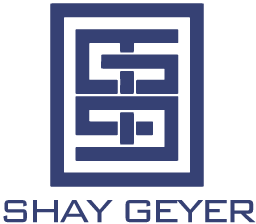 Make sure you follow the other featured designers. What an amazing group! I am floored by all of their transformations! Go check them out for yourself via the links below.